“Man is a part of nature, and his war against nature is inevitably a war against himself”. It was good to see on Tuesday of this week that the google search engine had as its theme an illustration depicting what would have been the 107th birthday of Rachel Carson. Rachel Carson was an American biologist and author of the seminal work “Silent Spring”, about the devastating impact on the environment of the pesticide Dichlorodiphenyltrichloroethane, better known by the acronym DDT. Google’s commemoration of Rachel Carson serves as a timely reminder that in the debate over whether genetically modified organisms (GMOs) are a force for good or ill, we would do well to look back at the lesson of DDT. DDT was originally used to combat malaria and typhus but it soon became more widely used as an insecticide in the agricultural revolution which followed the Second World War. One of the first companies to manufacture and market DDT was global chemicals giant Monsanto, now a leading proponent of GMOs. After its initial success as a pesticide, it soon became clear that many insect pests had developed resistance to DDT and that the chemical was also having a major environmental impact on other wildlife species, birds in particular. Rachel Carson’s book not only charted the devastating environmental damage caused by DDT but also questioned the logic of releasing large amounts of chemicals into the environment without a sufficient understanding of their effects on ecology or human health. Her work attracted outrage from Monsanto and others in the pesticide industry who mounted a concerted attack upon her credibility. Carson’s publisher was initially threatened with a lawsuit if it dared to publish the book. After publication, Carson was mocked in a brochure published by Monsanto parodying the book. She was described as “a hysterical woman” in the agricultural journals and the popular press and described as “probably a communist” by the then Agriculture Secretary Ezra Taft Benson. A reviewer of the book in Time Magazine described it as “unfair, one-sided, and hysterically overemphatic” and suggested this was because Carson had a “mystical attachment to the balance of nature”. As more and more Americans began to read The Silent Spring, the National Agricultural Chemical Association spent tens of thousands of dollars (a huge amount back then, in the early 1960s) on advertisements, pamphlets and newspaper inserts proclaiming the safety and necessity of DDT and other agricultural chemicals. “Who has decided — who has the right to decide — for the countless legions of people who were not consulted, that the supreme value is a world without insects, even though it be also a sterile world ungraced by the curving wing of a bird in flight? The decision is that of the authoritarian temporarily entrusted with power; he has made it during a moment of inattention by millions to whom beauty and the ordered world of nature still have a meaning that is deep and imperative”. Despite the smear campaigns against its author, The Silent Spring went on to become a best seller, and its success was followed by such a public outcry about DDT that the then US President, John F Kennedy, was forced into ordering an investigation into the possible harmful effects of the chemical. It took another ten years before DDT was finally banned for agricultural use in the United States, another twenty years before it was banned in the UK and over 40 years for much of the rest of the world, although the use of DDT still persists today in parts of India and North Korea. DDT is what is known as a persistent organic pollutant. In other words, it is resistant to environmental degradation and persists in the environment, continuing in perpetuity to have potential significant impacts on human health and the environment. Thanks to the lack of scientific caution that accompanied its introduction and the protectionist aggression that isolated and attacked those who questioned it, DDT will now always remain a danger to us. DDT has been labelled as a “probable carcinogen” by the USA Environment Protection Agency and research has established links between the chemical and increased risk of diabetes, cretinism, damage to the reproductive system, miscarriage, low sperm count and, more recently, increased risk of Alzheimer’s Disease. GMOs might similarly be described as a persistent genetic pollutant, since once they have entered the gene pool the consequences will remain with us in perpetuity. Like DDT, GMOs have not been subject to proper independent scientific testing before their release into the environment. Will it be another twenty or forty years before we realise the true impact of this folly both on our species and our environment? On that cheery note, let’s turn to this week’s recipe. It is both vegan and gluten free and it combines two natural, classic flavours associated with early summer – strawberries and elderflowers. The exceptionally mild Spring means elderflowers are now out in abundance and on my allotment plot, the Circus Garden, my Mara des Bois strawberries are producing lots of juicy ripe fruit. This is my first attempt at making ice cream using soya milk, and I’m really pleased with the result – not only is soya milk ice cream quicker and easier to make than conventional dairy ice cream, I find the depth of flavour is better as a result of the lower fat content. For the gluten free vegan crumble I used cold pressed organic coconut oil, available from health food stores and from some supermarkets. I don’t trust margarines, which often contain artificial colourings and flavourings as well as harmful trans fats. Coconut oil makes for a light and delicate crumble. As you might expect, it imparts a subtle coconut taste, but this complements the other flavours in this dish. If you don’t have the time or the inclination to forage for elderflowers then you’ll need to substitute 100 ml of elderflower cordial for the infused elderflower (but use a brand such as Belvoir, which is free from those nasty artificial flavourings, and halve the amount of maple syrup added to the ice cream mixture). 1. The ice cream will need to be made a day in advance. 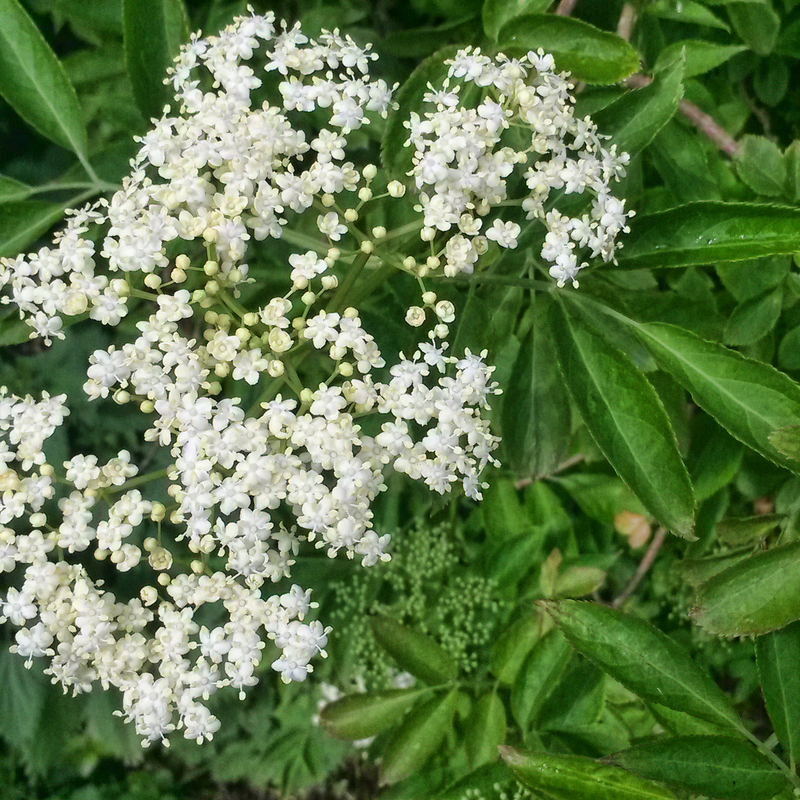 Use scissors to snip the heads of elderflower into smaller florets. 2. Split the vanilla pod lengthways. Put the elderflower heads, soy milk, maple syrup and vanilla into a pan over a low heat and stir. As soon as bubbles begin to appear at the edges of the liquid, remove the pan from the heat and set to one side to cool to room temperature and infuse. 3. Strain the infused elderflower liquid through a fine sieve to remove the vanilla pod and elderflower heads. Add the soy cream and whisk to combine then refrigerate for at least one hour. 4. Pour the chilled elderflower mixture into an ice cream maker and churn until it is thick, smooth and starting to set. Pour into a freezer proof container and freeze for at least 4 hours. You will need to remove the ice cream from the freezer and leave to stand at room temperature for 10 minutes before serving. 5. 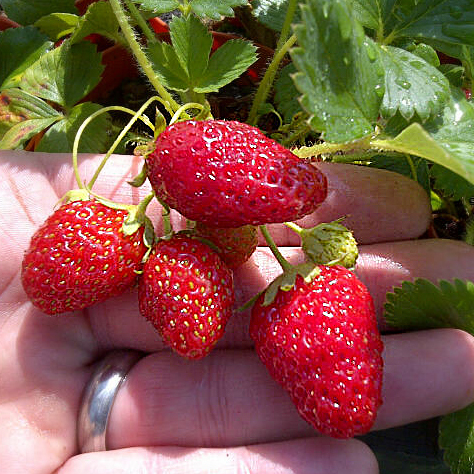 Halve the strawberries and place in a bowl with half of the sugar to soften and intensify the flavour of the fruit. 6. Now for the crumble, which we will make separately from the crumble filling. Pre-heat the oven to 170°C (325°F, gas mark 3). 7. Melt the coconut oil in a saucepan over a low heat. Place the oats, rice flour and ground almonds in a bowl and pour on the maple syrup and melted coconut oil. Mix to combine. You will end up with a dough-like consistency. Spread evenly across a flat baking tray and place in the oven for around 25 minutes, or until the crumble is an even golden brown colour. Remove from the oven and set to one side. When it is cool, break it up into a crisp crumble. 8. Finally, it’s time for the strawberry base. Cooking it separately from the topping means we can cook each to perfection, avoiding ending up with either an overcooked base or an undercooked crumble. The base will take a matter of minutes to cook, so make sure you have your ice cream out of the freezer when you start. Put 1 tbsp of water with the remaining 25 g of caster sugar into a saucepan over a low heat. Don’t stir but tip and swirl the pan to encourage the sugar to dissolve. Once the sugar has dissolved, increase the heat under the pan to medium and continue cooking, swirling the pan from time to time, until the liquid begins to turn a pale brown colour. Immediately add the strawberries and lemon juice, stir to combine and cook for one minute only. Remove from the heat. 9. To serve, place a generous spoonful of the strawberries onto each plate or bowl, topped with an equally generous spoonful of the crumble and a scoop of the elderflower ice cream. Weather permitting, eat this whilst sitting out in the garden, contemplating the glorious days of summer that may be yet to come. The strawberries are still green and the elderflowers still buds here, but as soon as they are ripe and ready your ice cream and crumble recipes will come in handy. Can I just check – is that really 60 tbsp maple syrup in the crumble topping? Sorry, didn’t want to pick out errors – just wanted to be sure for when I come to make it!